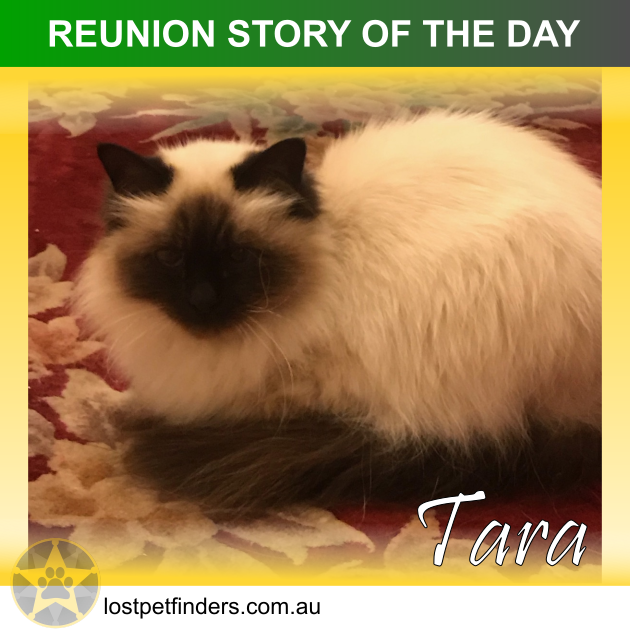 "We were very excited this afternoon to find Tara after 2 weeks missing. We had done all the things you suggested and are very grateful for your tips. The best suggestion was to letter box drop everyone in our long street and the immediate street behind. This gave us several phone calls from neighbour who said they had sightings. We did the posters, kept checking, calling etc etc. However we found her next door! I had been out in the back yard today calling her name and shaking her tin of biscuits as this is a noise the cats recognise. I really did not think this would do anything as I had done this nearly every day since she went missing and was not hopeful. We heard a meow and it got stronger as I called her name. Our neighbours who had already looked for her as well heard it and we both worked out finally that it was coming from under their house. We saw her through one of the floor space grills, and then via their crawl space door, I shone a torch, called her name and she came to me. We don’t know how she got in and why she could not get out. I don’t believe she had been there for 2 weeks as we would have heard her before. She had lost her collar so I suspect something happened and she finally found her way back. Thank you truly for your site. Your helpful emails and the support of others made a big difference. Took her to vet today and apart from losing close to 1kg in weight vet says she is looking remarkably good for a cat lost for 14 days. I do know there are kind people out there and maybe someone left some water/food during this time for her. Otherwise how do they survive?? I know I would do this if I saw a cat/dog that looked lost. I think this proves again for me that all cats are smart animals! It is so nice to see all the 'finally they are home' stories on your sites. Unfortunately I know there are some owners that are not so fortunate, which is very sad.